You wake up one morning and you realize that two and a half years have passed. And yet, this time did not just fly by: it was full of wonderful (and not-so-wonderful) memories and experiences, and with friends and family. Of course, this being a wine blog, the time was also filled with some excellent wine. I type this from sunny California. It is literally sunny (yesterday was 77 degrees, today is going to be 80), with uncharacteristically perfect blue skies through which you can see the San Gabriel Mountains. I just flew in from DC on Saturday and have already had some great Chinese food–great Mexican food awaits. Bookending my flight: Life by Keith Richards, which I highly recommend; two finals, courtesy of law school; clinic work, also courtesy of law school; drinking, courtesy of my nascent alcoholism; and a few bottles of wine had on either side of the continent. The first bottle I want to write about is the young 2008 Roger Belland “La Fussière” Maranges 1er cru (Ansonia Wines, $22). This is almost criminally young, but despite that (or because of that…?) it is tantalizingly good. The nose on this is incredible, just exploding from the glass with strawberry and red fruits. It has pronounced acidity and not too much tannin, and it is very lean and juicy. It is a pretty expression of Burgundy, fruit, not funk; berries, not earth. This is reminiscent of good Beaujolais cru. 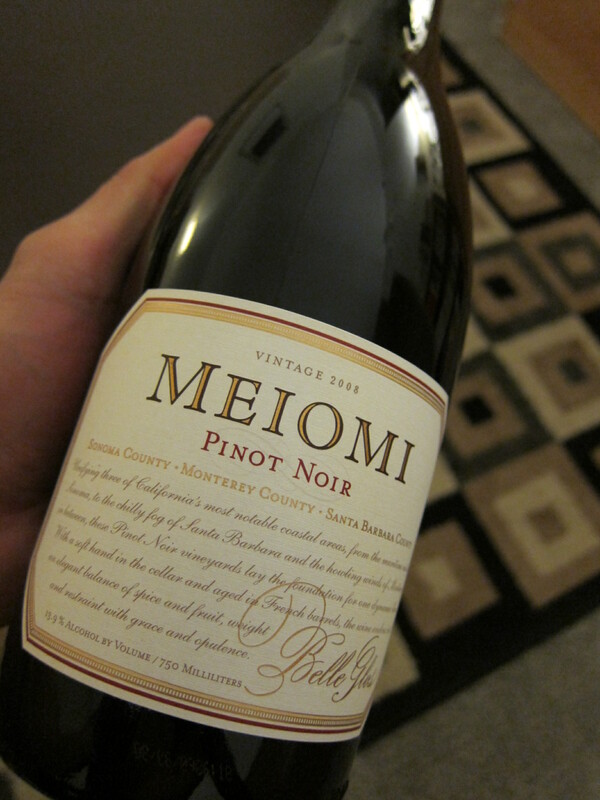 The 2008 Meiomi “Belle Glos” Pinot Noir (Pearson’s Wine and Spirits, $20ish) is a blend of Pinots from California’s Sonoma, Monterey, and Santa Barbara counties. I had had it before at Mission Wines in South Pasadena, but that was years ago. All I remembered was that it was a quality wine but one I didn’t necessarily want to purchase again. I tried it again at Pearson’s with Heather, and again it was not impressive–except that there was something about it, some Mickey Rourke-like spark that kept me from writing it off. There was some funk hiding beneath the tired waves of old fruit that made me wonder if this had something else to offer. I told this all to Larry, the pourer, who said that this bottle had been open since the day before and that he would open a fresh bottle (so nice of him, right? I would HIGHLY RECOMMEND Pearson’s to anyone with access to Glover Park). The new bottle: wow! What a difference! The tired waves of old fruit were rejuvenated and became supple cascades of ripe plum and jujubes, offset by baking spice and underlined by that funkiness I had tasted in the first bottle. Substantial body and great tannins to balance the acidity. Very fragrant nose. Now, I love me some Burgundies, but sometimes you gotta go back to where you come from. California, constantly lambasted for being Hollywood-like in its oenophilic expressions, for being too big, too bold, too brash–well, California is a big place. France and Spain and every other winemaking region have their villains as well. Yet another France-California face-off: any Châteauneuf-du-Pape blanc versus the 2007 Stolpman “L’Avion” ($30s) brought very kindly by Billy to a Mission Wines tasting I went to yesterday. From the Santa Ynez Valley it is composed of 90% Roussane and 10% Viognier (though the 2008 vintage is 100% Roussane). This has a very pretty light straw color but clocks in at a hefty 14.8% ABV. Nutty but mouth-puckering, with a solid base of mineral and clay. Floral nose–apparently, it smelled like honeysuckle, though I don’t even know what that means. Great body and finish. One of my favorite wines of the past year was the 2007 Paul Autard Châteauneuf-du-Pape blanc; if I had to compare them, I would think that the Autard is a bit more refined and with more minerals, whereas the Stolpman is more voluptuous and fruity. Both are great, and the Stolpman is a significant bit less expensive. Before I go, a closing note on another Californian wine I tried. The 2009 Orin Swift “Abstract” (Mission Wines, $23ish) is a blend of predominantly Grenache, with Syrah and Petit Syrah from Sonoma. Orin Swift is the maker of the ludicrously popular “The Prisoner”, which is good but a bit too much for my taste. Not so with the Abstract. Black fruits, licorice, light-to-medium body. Definitely drinkable alone but probably also enjoyable with lamb or, I’m thinking some sort of meat-based parpadelle dish. I do enjoy DC and the East Coast; I do also love French wines. But sometimes, damn it, it’s good to be home. Do you have any plans to come up to the Bay Area while you’re back in the state, Joon? It’d be good to catch up over a bottle of wine! I’d like to but unfortunately not. But I’ll be graduating and headed back to California for good–definitely will have to come up to the Bay Area then. A beer or two (or three) are in order, Kris! Looks like you have yet to review Lodi wines…you are missing out on one of the biggest and recently named top wine regions. They’ve been juicing Napa bottles for decades. And the value is unbeatable.